YOU UNDERSTAND AND AGREE THAT THE SERVICE IS PROVIDED ON AN “AS IS” AND “AS AVAILABLE” BASIS AND THAT DORA FARKAS, LLC, DBA FINISH YOUR THESIS, (THE “COMPANY”) ASSUMES NO RESPONSIBILITY OR LIABILITY FOR THE TIMELINESS, DELETION OF CONTENT OR FAILURE BY THE SERVICE. COMPANY EXPRESSLY DISCLAIMS ALL WARRANTIES OF ANY KIND, WHETHER EXPRESSED OR IMPLIED, INCLUDING, BUT NOT LIMITED TO, THE IMPLIED WARRANTIES OF MERCHANTABILITY, FITNESS FOR A PARTICULAR PURPOSE AND NON-INFRINGEMENT OR ANY WARRANTY THAT (A) THE SERVICE WILL MEET YOUR REQUIREMENTS, (B) THE SERVICE WILL BE UNINTERRUPTED, TIMELY, SECURE OR ERROR-FREE, (C) THE RESULTS THAT MAY BE OBTAINED FROM THE USE OF THE SERVICE WILL BE ACCURATE OR RELIABLE, (D) ANY CONTENT OR INFORMATION YOU PROVIDE OR COMPANY COLLECTS WILL NOT BE DISCLOSED OR (E) ANY ERRORS IN ANY SERVICE WILL BE CORRECTED. YOU AGREE THAT USE OF THE SERVICE AND THE WEBSITE IS AT YOUR OWN RISK. THE SITE DOES NOT PROVIDE MEDICAL ADVICE. ANY HEALTH-RELATED INFORMATION ON THE SITE IS FOR INFORMATION PURPOSES ONLY. IT IS NOT INTENDED TO BE A SUBSTITUTE FOR PROFESSIONAL MEDICAL OPINION, DIAGNOSIS OR TREATMENT. ALWAYS SEEK THE ADVICE OF A PHYSICIAN OR QUALIFIED MEDICAL PROFESSIONAL. YOU EXPRESSLY UNDERSTAND AND AGREE THAT COMPANY WILL NOT BE LIABLE FOR ANY DIRECT, INDIRECT, INCIDENTAL, SPECIAL, PUNITIVE, COMPENSATORY, CONSEQUENTIAL OR EXEMPLARY DAMAGES (EVEN IF COMPANY HAS BEEN ADVISED OF THE POSSIBILITY OF SUCH DAMAGES) (COLLECTIVELY, “DAMAGES”), RESULTING FROM: (A) THE USE OR INABILITY TO USE THE SERVICE; (B) THE COST OF ANY GOODS AND/OR SERVICES PURCHASED OR OBTAINED AS A RESULT OF THE USE OF THE SERVICE; (C) DISCLOSURE OF, UNAUTHORIZED ACCESS TO OR ALTERATION OF YOUR INFORMATION OR CONTENT; (D) CONTENT YOU SUBMIT, RECEIVE, ACCESS, TRANSMIT OR OTHERWISE CONVEY THROUGH THE SERVICE; (E) STATEMENTS OR CONDUCT OF ANY SERVICE PROVIDERS OR OTHER THIRD PARTY THROUGH THE SERVICE; (F) ANY OTHER MATTER RELATING TO THE SERVICE; (G) ANY BREACH OF THIS AGREEMENT BY COMPANY OR THE FAILURE OF COMPANY TO PROVIDE THE SERVICE UNDER THIS AGREEMENT OR (H) ANY OTHER DEALINGS OR INTERACTIONS YOU HAVE WITH ANY SERVICE PROVIDERS (OR ANY OF THEIR REPRESENTATIVES OR AGENTS). THESE LIMITATIONS SHALL APPLY TO THE FULLEST EXTENT PERMITTED BY LAW. 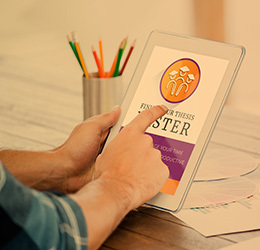 Get started with your free copy of "Finish Your Thesis Faster"
Download my strategic guide to fire up your motivation, get laser focused and accelerate your thesis writing starting today.